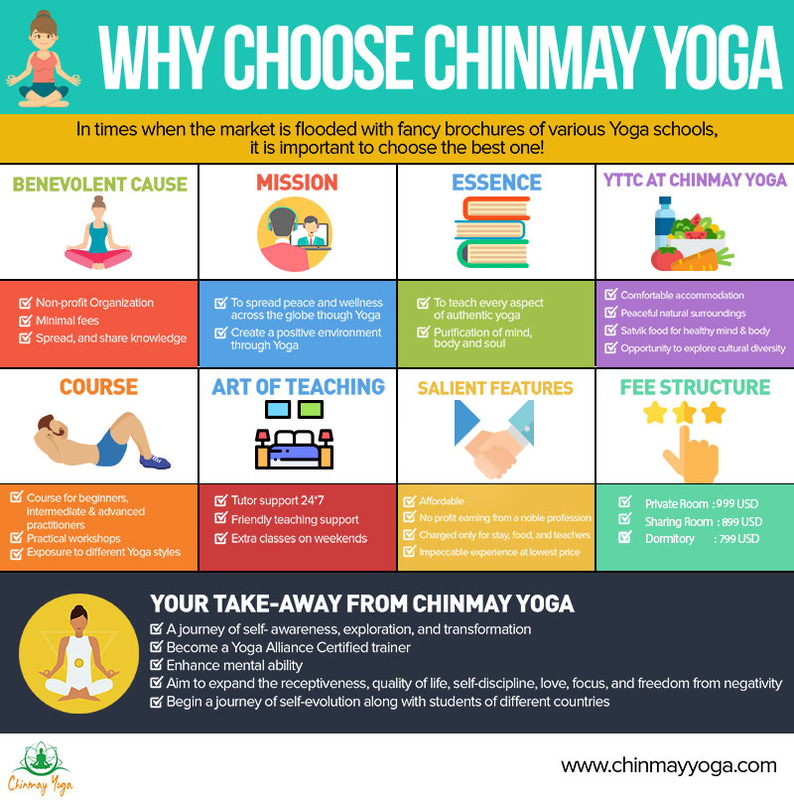 Chinmay Yoga offers a 200-hour multi-style yoga teacher training course which not only provides with a profound knowledge of Yoga and its distinct branches, but also helps you analyze the various traditional texts. However, there are courses designed especially for those individuals who do not have the time, but are intending to develop their skills and practice better or even adding more hours to their Yoga Teacher Training certificate. Here, at Chinmay Yoga in Dharamsala, we will help in developing your understanding about Hatha yoga and its branches, namely, Shatkriya, Asana, Pranayama, Mudra, Bandha, Samadhi, as well as, concentrate on a couple of eminent traditional writings. In addition to learning the perfect postures and asanas, our Yoga Teacher Training program will also focus on various styles of Surya/Chandra Namaskar (Sun/Moon Salutations), opening and closing mantras, Pranayama structures, like Kapalbhati, Bhastrika, Seetali, Mudras, Bandhas and more. We have formulated this course keeping in mind the ones who wish to form a foundation in Yoga and enhance their skills. Yoga Teacher Training in Dharamshala is an internationally recognized and supervised by the most experienced Yoga trainers, which will enable you to find your own voice as an aspiring trainer. Yoga Teacher Training courses are conducted in a fun, casual and dynamic atmosphere, which also includes the Yogic convention. We, at Chinmay Yoga, will ensure that all our students have the tools and chances to enhance their skills and learn to the best of their abilities. We make combinations and alignments, keeping in mind the asana practice, meditation, mantra chanting and self-reflecting exercises, which will modify the practice and help in applying the yogic assets to every part of the life, preparing you to train others with confidence. Amidst the heavenly snow-capped mountains and tranquility and late morning sessions, students have an amazing opportunity to learn to analyze their own and mind by recognizing characteristics and misalignments. Every Yoga Teacher Training course of our institution is especially thought through for the yoga enthusiasts who can commit completely to self-awareness, exploration, and transformation. The course aims at acquainting you with a portion of the standard writings of the Indian theory. The writings will be translated and summarized for your convenience. JOIN US AT CHINMAY YOGA! We recommend our intensive course of Yoga Teacher Training to all the yoga professionals, who wish to develop their philosophical knowledge. Our “Yoga and Vedanta” will broaden your thinking by giving you relatively different perspectives as it will involve looking at a question from various angles. The study of Vedanta and the Philosophy of Yoga are both thorough processes of learning, which draw material from the ancient principles of Hindu philosophy. Our course covers a majority of the relevant themes, focusing more on the flow of thoughts. Yoga Teacher Training in Dharamsala will be a progress of individuality for those have been to India recently. For those who will be visiting India for the first time, this course will develop you physically and your inner self. The course will aim at expanding the receptiveness, quality, self-discipline, love, and focus, freeing the individual from negativity. The experience and association with fellow yogis and trainers will help in making your path clearer and help you concentrate better. You will each conduct a class of your own before you complete the course, on the basis of what you have learned and the knowledge. After finishing the course and receiving a certificate from the International Yoga Organization and Yoga Alliance USA, students will be able to train others and pave their own ways. We hope that you will attend each class diligently. Despite the arduous structure of the course, we ensure two days of free time every week with Karma yoga treks and a few common outings. Throughout the course, each of you will bond beautifully with the fellow students and trainers. You will have a whole new family as you finish the course with the relations you made during the course.